A favorite spring blossom – daffodils it is! What one, easy to grow flower symbolizes such cheeriness and sunshine in one tiny stem. 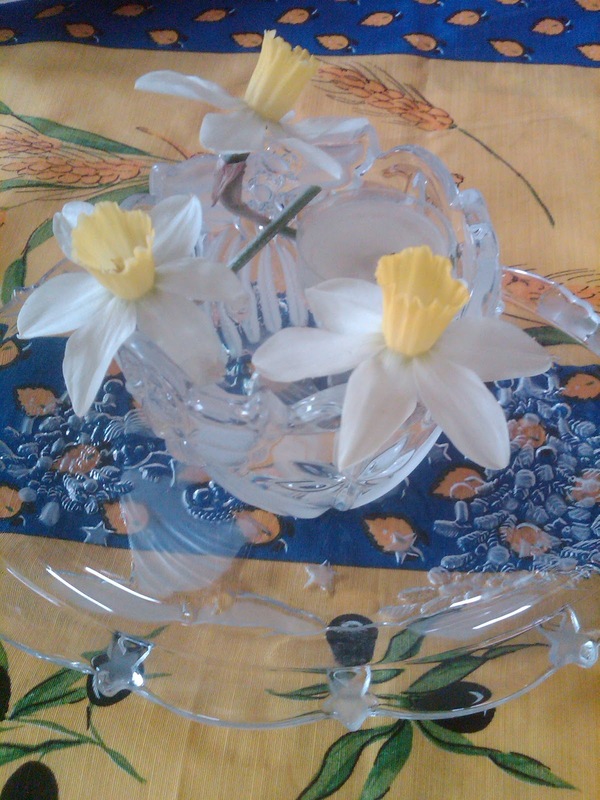 If you’re daffy about Daffodils, just like me, here’s a simple floral arrangement for your desk, coffee table or anywhere you need a shot of spring! As L.A. Davidson pointed out, "Flower arrangement: just two yellow daffodils, the first to bloom." Add an extra blossom so it floats in your favorite glass or crystal bowl to make it three. It’s your arrangement; just make it sing spring! P.S. My, the spring garden peepers have been very quiet. So unless you send along those questions or comments, the only peeps you hear are from me! Do you have garden questions or a topic you’d like to read about? The usual ways are listed below. Most important, remember to check in frequently.